Rain is pattering on the roof as the wind whips the palms outside my window. A dark cloud hovers over Green Cay Bay. Just an hour ago I was padding over lavender and green fan coral doing a graceful underwater ballet beneath the bay’s translucent waters. Blue see-through fishes darted among enormous brain corals and other-worldly creatures. One coral looked like a pipe organ and another, the queen’s wave. A baby green turtle swam with us briefly showing off the black mottled markings on his head and flippers before wafting away. I breathed in sync with the wash of the waves as we glided over the reef balanced on foam tubes called noodles. The day had begun with a relaxed breakfast at Dirty Nate’s on the boardwalk in the colonial Dutch town of Christiansted. A seaplane landed upon the aquamarine waters bringing in a few tourists from St. Thomas just 40 miles away. It’s September’s high humidity and threats of hurricanes that keep the boats of “yachties” moored in the safe harbor. 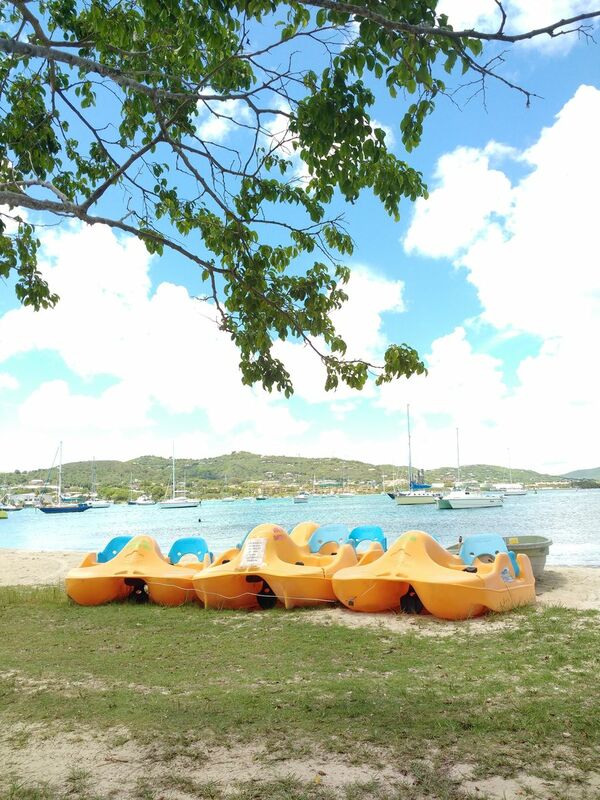 This makes it lovely for those who stay and breathe in the serenity of St. Croix this time of year. 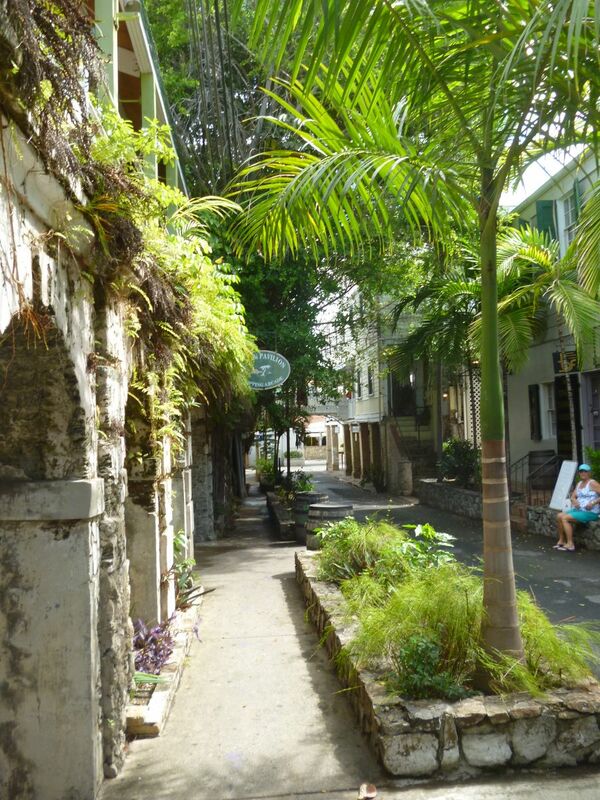 A stroll through vine-covered arcades of the colonial buildings left over from the 1700s when the Dutch ruled over a thriving slave trade garnered some great bargains in the shops. My hostess, Sharon North Pohl owner of Zealloushorses.com, wanted me to have an equestrian experience while on the Island. The ride with Jill, a real “Cruzan” character, is worth the price of admission. We trammeled through shady tree tunnels with tendrils hanging down from giant Rain Trees. Jill has been taking tourists out since she was 5. Her father and grandfather have lived on this land. She has a maze of trails through the jungle that grows back at about a foot a day. We passed remnants of trees blown down when Hugo flattened the Island in 1989, turning buildings into rubble and spitting boats out of the marinas. Our ride was capped off with a glorious lope on the beach. Tantalizing turquoise waters lifting foamy waves landed on the white sand shore. The cooling spray was a welcome respite from the tropical sun overhead. Back in the cool of the forest Jill shared her limitless knowledge of plants and local lore that included passing a shack where slaves lived in quiet desperation for hundreds of years until their revolt and emancipation in 1848. Lunch of jerk chicken tacos with lobster salsa and a mango daiquiri at laid-back Rhythms on Rainbow Beach followed by a swim in lapis lazuli waters was nothing short of heavenly. In the distance we could see the pier in Fredericksted, another charming colonial town where cruise ships dock about once a week. A palm-lined green belt sprinkled with a row of shops and eateries graces the shore. The Fredericksted fort built in 1760 houses a fine museum. The horrors of slavery during the plantation hey-day are detailed in a room with two-foot-thick walls that keep the enclosure bearably cool. Upstairs, the commander’s quarters enjoyed airy windows and a sea breeze. There is a wonderful display of sea shells from the around the world collected by yachties who have come to call St. Croix home. Local artisans also share their wares here at surprisingly reasonable prices. In the courtyard a battery of cannons line the walls to fend off attacks from marine invaders. 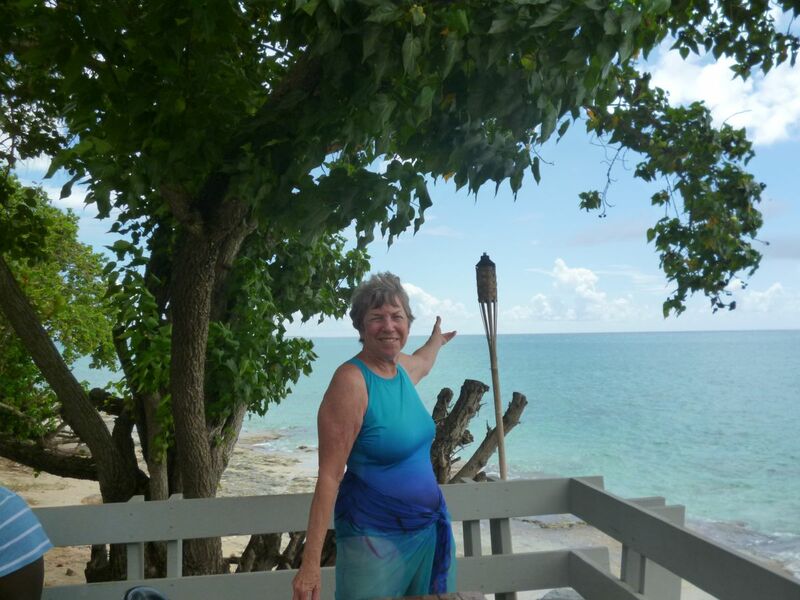 A highlight of my week with Sharon was hiking through a sub-tropical forest with vistas of the azure sea sparkling far below to the tide-pools. There we stripped down to our bathing suits and took a leisurely soak in tepid waters populated by tiny fishes. At high tide the pools are refreshed with crashing waves over the sea wall that form waterfalls. Another outing took us to Point Udall, the most easterly point in the United States and trailhead to Isaac and Jacks Bay. Deep aquamarine waters beckoned as we made the leisurely hike through waist-high grasses down to the undeveloped marine sanctuary for fishes and nesting turtles. A snorkel here garnered sightings of parrot fish and shoals of blue tang darting in and out of brain coral. A picnic and a snooze later, we headed back to civilization. Mounds of white taffy are overtaking the pastel blue heavens. Only traces of gray linger as I write this story. How astounding it is that this transformation takes place in such a short time. A rainbow is fanning across the sky. I love the tropics for their moodiness and their splendid celestial panoramas. 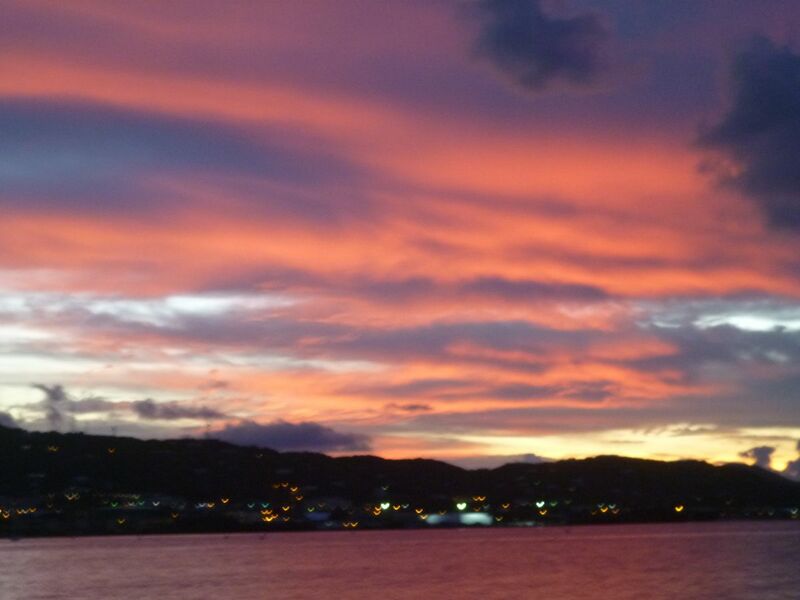 Nature presents herself more intensely beautiful here in sublime St. Croix. 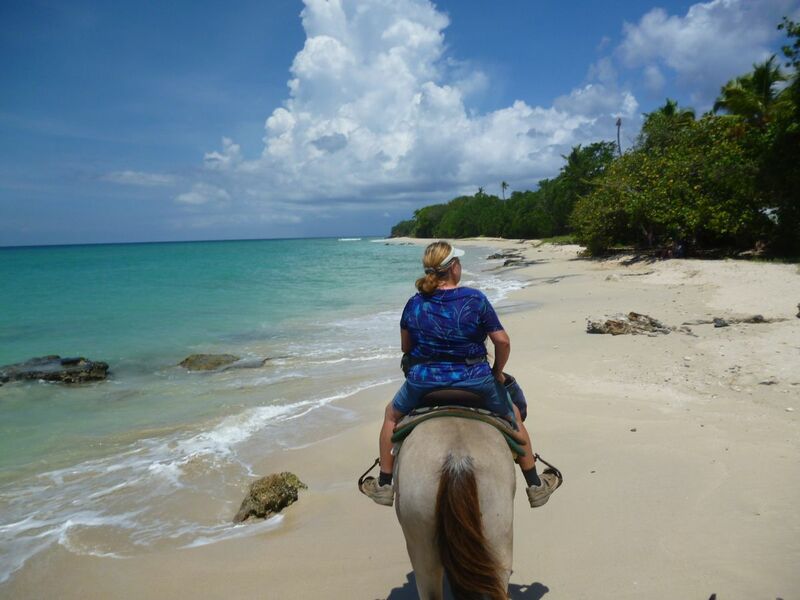 Note: My hostess, Sharon North Pohl owner of Zealoushorses.com, is happy to assist traveler’s venturing to her Island Home. You may contact her directly through her site.